This fresh blueberry pie is a great dessert to make for any occasion. If blueberries don't happen to be in season, frozen will work just fine. The sour cream custard filling and crumb topping make this pie extra special. In a bowl, stir together the 1 cup flour and 1/4 teaspoon salt. Add the butter in small pieces and cut into the flour with a pastry blender until the mixture resembles coarse crumbs. Stir in just enough ice cold water to moisten the flour mixture. Shape into a ball, flatten slightly, and wrap in plastic wrap. Refrigerate for 20 to 30 minutes. On a floured surface, roll the dough out into a 12-inch circle. Fit into a 9-inch pie plate. Trim to 1/2 inch from the edge of the pan, then crimp or flute the edge. Chill until ready to fill. Combine 4 tablespoons of flour, the brown sugar, 3 tablespoons of butter, and 3 tablespoons of chopped pecans. Work with fingers until the mixture is crumbly. Set aside. In a mixing bowl, beat the sour cream, 2 tablespoons flour, egg, 3/4 cup sugar, vanilla, and 1/4 teaspoon salt until smooth. Gently fold in the blueberries. Pour the custard filling mixture into the chilled crust. Bake for 20 minutes. Sprinkle topping mixture evenly over the pie. Return to the oven and bake for 10 minutes longer, until nicely browned. Cool on a rack, then cover and refrigerate until serving time. Serve chilled with a scoop of vanilla ice cream or dollop of lightly sweetened whipped cream. Blueberry Pie: Here's a classic blueberry pie, lightly spiced with cinnamon. Use your favorite pastry recipe or purchased refrigerated pastry to make this recipe. 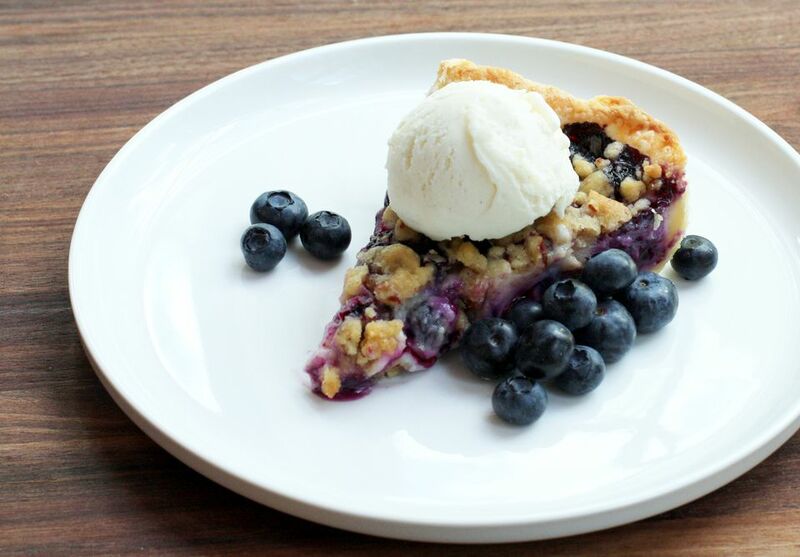 This pie can be made with fresh or frozen blueberries. Terri's Blueberry Pie: Terri's 2-crust blueberry pie is flavored with a little lemon juice, which complements the berries nicely. This is a great pie to serve warm with a big scoop of ice cream, and it's perfect for a holiday dinner. Blueberry Cobbler: This cobbler is made with a wonderful blueberry filling. The topping is a soft sweetened biscuit-like dough, spiced with a little cinnamon. Serve this cobbler warm with cream or ice cream.